“I hope you have had a good night,” he said earnestly. “So that is what it is called,” said Maimie thoughtfully. You can’t think how pleased Peter was to learn that all the people outside the gates knew about him. He begged Maimie to tell him what they knew and what they said, and she did so. They were sitting by this time on a fallen tree; Peter had cleared off the snow for Maimie, but he sat on a snowy bit himself. “What is that?” he asked, and she showed him, and then he did it. They talked together and he found that people knew a great deal about him, but not everything, not that he had gone back to his mother and been barred out, for instance, and he said nothing of this to Maimie, for it still humiliated him. “Do they know that I play games exactly like real boys?” he asked very proudly. “Oh, Maimie, please tell them!” But when he revealed how he played, by sailing his hoop on the Round Pond, and so on, she was simply horrified. Poor Peter uttered a little moan at this, and he cried for the first time for I know not how long. Maimie was extremely sorry for him, and lent him her handkerchief, but he didn’t know in the least what to do with it, so she showed him, that is to say, she wiped her eyes, and then gave it back to him, saying “Now you do it,” but instead of wiping his own eyes he wiped hers, and she thought it best to pretend that this was what she had meant. She said, out of pity for him, “I shall give you a kiss if you like,” but though he once knew he had long forgotten what kisses are, and he replied, “Thank you,” and held out his hand, thinking she had offered to put something into it. This was a great shock to her, but she felt she could not explain without shaming him, so with charming delicacy she gave Peter a thimble which happened to be in her pocket, and pretended that it was a kiss. Poor little boy! he quite believed her, and to this day he wears it on his finger, though there can be scarcely any one who needs a thimble so little. You see, though still a tiny child, it was really years and years since he had seen his mother, and I daresay the baby who had supplanted him was now a man with whiskers. But you must not think that Peter Pan was a boy to pity rather than to admire; if Maimie began by thinking this, she soon found she was very much mistaken. Her eyes glistened with admiration when he told her of his adventures, especially of how he went to and fro between the island and the Gardens in the Thrush’s Nest. “How romantic,” Maimie exclaimed, but it was another unknown word, and he hung his head thinking she was despising him. “I suppose Tony would not have done that?” he said very humbly. “What is afraid?” asked Peter longingly. He thought it must be some splendid thing. “I do wish you would teach me how to be afraid, Maimie,” he said. He could scarcely believe she meant it, but when he did believe he screamed with joy. Very reluctantly Peter began to take the thimble off his finger. He thought she wanted it back. “It’s like this,” she said, and kissed him. “If you squeeze close,” he said eagerly. He assured her that the birds would love to have her, though I am not so certain of it myself. Also that there were very few birds in winter. “Of course they might want your clothes,” he had to admit rather falteringly. “They sha’n’t have my fur,” she said sharply. “Come and be one then, dear Maimie,” he implored her, and they set off for the boat, for it was now very near Open-Gate time. “And you are not a bit like a nest,” he whispered to please her. “Oh, no,” answered Peter, but in his heart he knew it was very like that, and he would have told her so had he not been in a quaking fear of losing her. He was so fond of her, he felt he could not live without her. “She will forget her mother in time, and be happy with me,” he kept saying to himself, and he hurried her on, giving her thimbles by the way. “If you are sure your mother will always want you,” he added rather sourly. “The idea of mother’s not always wanting me!” Maimie cried, and her face glistened. “If she doesn’t bar you out,” said Peter huskily. “Then,” said Peter, not without grimness, “step in, if you feel so sure of her,” and he helped Maimie into the Thrush’s Nest. “But why don’t you look at me?” she asked, taking him by the arm. Peter tried hard not to look, he tried to push off, then he gave a great gulp and jumped ashore and sat down miserably in the snow. She went to him. “What is it, dear, dear, Peter?” she said, wondering. And then he told her the woful story of how he had been barred out, and she gasped all the time. Just then they heard a grating creak, followed by creak, creak, all around the Gardens. It was the Opening of the Gates, and Peter jumped nervously into his boat. He knew Maimie would not come with him now, and he was trying bravely not to cry. But Maimie was sobbing painfully. Then he pressed a last thimble on her sweet little mouth, and covered his face with his hands so that he might not see her go. “Dear Maimie!” cried the tragic boy. She leapt into his arms, so that it was a sort of fairy wedding, and then she hurried away. Oh, how she hastened to the gates! Peter, you may be sure, was back in the Gardens that night as soon as Lock-out sounded, but he found no Maimie, and so he knew she had been in time. 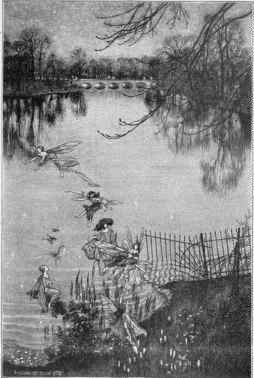 For long he hoped that some night she would come back to him; often he thought he saw her waiting for him by the shore of the Serpentine as his bark drew to land, but Maimie never went back. She wanted to, but she was afraid that if she saw her dear Betwixt-and-Between again she would linger with him too long, and besides the ayah now kept a sharp eye on her. But she often talked lovingly of Peter, and she knitted a kettle-holder for him, and one day when she was wondering what Easter present he would like, her mother made a suggestion. “But it isn’t a real goat,” Maimie said. “It seems very real to Tony,” replied her mother. She then flung her arms about as if she were sowing seed, and turned round three times. She also left a letter to Peter in a likely place, explaining what she had done, and begging him to ask the fairies to turn the goat into one convenient for riding on. Well, it all happened just as she hoped, for Peter found the letter, and of course nothing could be easier for the fairies than to turn the goat into a real one, and so that is how Peter got the goat on which he now rides round the Gardens every night playing sublimely on his pipe. And Maimie kept her promise and never frightened Tony with a goat again, though I have heard that she created another animal. Until she was quite a big girl she continued to leave presents for Peter in the Gardens (with letters explaining how humans play with them), and she is not the only one who has done this. David does it, for instance, and he and I know the likeliest place for leaving them in, and we shall tell you if you like, but for mercy’s sake don’t ask us before Porthos, for were he to find out the place he would take every one of them. Though Peter still remembers Maimie he is become as gay as ever, and often in sheer happiness he jumps off his goat and lies kicking merrily on the grass. Oh, he has a joyful time! But he has still a vague memory that he was a human once, and it makes him especially kind to the house-swallows when they revisit the island, for house-swallows are the spirits of little children who have died. They always build in the eaves of the houses where they lived when they were humans, and sometimes they try to fly in at a nursery window, and perhaps that is why Peter loves them best of all the birds. And the little house? Every lawful night (that is to say, every night except ball nights) the fairies now build the little house lest there should be a human child lost in the Gardens, and Peter rides the marshes looking for lost ones, and if he finds them he carries them on his goat to the little house, and when they wake up they are in it and when they step out they see it. The fairies build the house merely because it is so pretty, but Peter rides round in memory of Maimie and because he still loves to do just as he believes real boys would do. But how strange for parents, when they hurry into the Gardens at the opening of the gates looking for their lost one, to find the sweetest little tombstone instead. I do hope that Peter is not too ready with his spade. It is all rather sad. Peter’s Goat last modified December 31st, 2011.